There’s something unusually attractive about a gothic font design. It can make any typographical layout look magnificent and majestic, and it’s probably why gothic fonts are widely used in branding and logo design. If you’ve been looking for a unique gothic font for a new project, you’re in luck. We’ve handpicked the best gothic fonts for this collection, with various design styles that you can use to design logos, book covers, posters, website headers, t-shirt designs, and much more. Explore the collection and start downloading! Medusa is one of the most beautiful gothic fonts we’ve seen that represents the core features of a true gothic font. Featuring unique ornaments and serifs, the font keeps its elegance throughout its design. This makes it the perfect choice for professional logos, book covers, titles, and much more. Millenium is a monoline blackletter font that also features certain gothic design elements, such as the ornamental curves and unusually geometric style letters. The font comes with a mixed design of both vintage and modern worlds. Haext is a truly one of a kind gothic font. 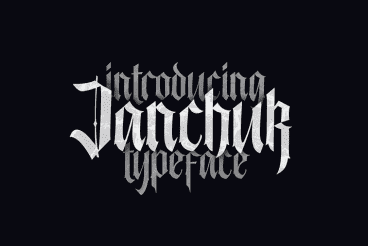 As its creator puts it, it’s a “neo-Goth rustic Art Nouveau” font. The font seems to have a unique design of its own that will truly help add a personal touch to your various types of designs. Fenrir is a bold serif font that comes with a gothic style design. It also features vintage design elements, making it a great choice for designing labels, packaging, badges, and more. Osgard Pro features a modern luxury gothic design that mixes both Gothic and Blackletter design styles together. This font is perfect for logotypes and branding works related to luxury brands, businesses, high-end products, and fashion brands. The font also includes 1000 swashes and lots of ligatures as well. The gothic version of the Cheddar font features a bold and stylish design. It includes two hand-drawn font designs, each with its own typefaces of different font weights, making a total of 8 styles of fonts. It’s also an all-caps typeface. Dramaga is a creative gothic font that will certainly remind you of the logo from Metallica. It has a unique design that will help you create logos, titles, headers, and posters that will instantly grab the attention of your audience. The font comes with all the basic ligatures, alternates, and swashes as well. Flexiletto features a classic vintage look and feel that’s been inspired by the old-school print and signage designs. This font is perfect for vintage-themed designs such as label designs for beer and drink brands as well as many others. Goliath is a collection of 4 different fonts that features vintage gothic designs. The decorations, ornaments, and the unique style of serifs give an authentic look to this font. It includes fonts in regular, inline, and grunge styles. Portico is a display font that features a unique bold gothic design. It’s the type of font that you would use to create bold headlines, titles, and headers in posters and book covers. The font is also great for logotype designs. Black Baron comes with a creative blackletter design mixed with gothic font elements. The mixed gothic vintage and retro design make this font an ideal option for greeting cards, posters, badges, and various other design projects. Stay High is a vintage blackletter font that comes with a design inspired by the old Victorian era as well as certain elements of gothic designs. It includes uppercase, lowercase, and numeral characters. This font features a unique handmade design that also comes with a gothic feel. The font is available in 2 different styles of designs made for crafting logos, posters, banners, and more. Glaive is a bold gothic font that comes with a unique style of serifs that’s been inspired by gothic design. The font is an all-caps font that includes alternate characters that can be toggled with the capslock. This is a classic blackletter font you can use to design unique logos, posters, and various other designs. The font features unique serif style as well as an uncommon flow of design. Spearhead font comes with uppercase and lowercase letters as well as 252 glyphs and multilingual characters. This font features a mixed design of both gothic and modern culture. Marema is a beautiful retro-vintage font also features lots of different gothic design elements. It comes with a serif design with rounded edges and a creative flow. The font includes ligatures, stylistic alternates, and more. Ethline is the perfect font you can use to design a logo, badge, business card, or a flyer for a luxury brand or a business. The font is available in 4 different styles: Regular, Oblique, Rough and Rough Oblique. Montagna LTD font features an elegantly minimalist design that you can use to craft titles, headings, and more for almost any type of a brand or business. The font design is inspired by the designs from the early twentieth century Italy. Citrus Gothic is a family of gothic fonts that comes with various styles of fonts, including solid, rough, inline, textured, shadow, and more. The entire font family features all-caps letters as well. This creative gothic font features a narrow design with ornaments. The font is most suitable for rock music, horror, and Halloween-themed design projects. Gothink is a collection of 47 different gothic fonts. It includes typefaces with many different styles, font weights, and sizes. It should provide you with enough font choices for all kinds of design projects. Be sure to check out our best monogram fonts and best logo fonts collections as well.